Seven Historic Police Stations - Redstone Architects Inc. 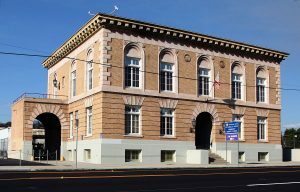 In the United States of America, there are many unique and historic police station buildings that have been preserved. These historic police stations served their police departments very well for many years, but because of age, growing size of the police departments, and/or efficiency of the design of the buildings, many of them have ceased to be used as police stations. Here are some historic police stations that are still standing today. The Highland Park Police Station is one of the most famous and architecturally significant police stations in Los Angeles because it is the last remaining police station in Los Angeles that was built in the 1920s. The station was built in 1925-1926 and was closed in 1983. Currently, the station is used as the Los Angeles Police Museum, and is in high demand for use in films and TV shows. For example, the station is used for an establishing shot of the Pawnee Police Station in the popular TV show starring Amy Poehler, “Parks and Recreation”. The Eighth Precinct Police Station in the Woodbridge neighborhood of Detroit is one of the most unique police stations in the country in terms of its design. 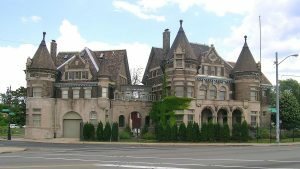 Built in 1900-1901, by architect Louis Kamper, who also designed the Book-Cadillac Hotel, the Eighth Precinct Police Station makes use of the Chateauesque style.3 Both the attached carriage house, later used as a garage, and the two iconic conical roofed towers make the building very distinctive. 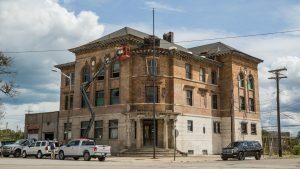 The building was used by police up until the 1950s, after which it began to fall into disrepair.4 In 1973, the building became a Michigan State Historic Site.5 In 2013, the building was repurposed and made into lofts.6 In 2016, Redstone Architects and SDG worked on the replacement building, which was opened in 2017. 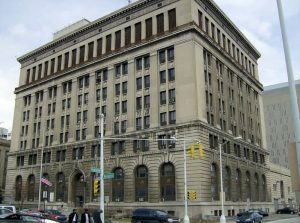 The historic Detroit police headquarters was opened in 1922, right in the middle of Prohibition, and was used as the police headquarters until 2013. The building was designed by the legendary Albert Kahn, and in the 91 years that it was used, many dramatic incidents unfolded. One of these events included an attempted escape, where a prisoner jumped from the fifth floor, before being captured because of his resulting broken leg. The building was used for many movie sets, including “Out of Sight,” “True Romance,” “Detroit 9000,” “Betty Anne Waters” and the “Beverly Hills Cop”. 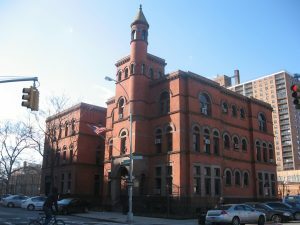 The 88th Precinct Police Station is another police station famous for its castle-like architecture. The building was built in 1898, making it one of the oldest police stations in New York. The building was designed by architect George Ingram, and the Romanesque Revival design includes a five-story turret and cone shaped roof. The third precinct police station, located near Eastern Market, was in use from 1897 to 1959. The Beaux Arts style building was designed by Edward van Leyen. One of the most unique architectural aspects of the building is the elaborate metal cornice, designed by the Detroit Cornice and Slate firm. The upper floors of the building contained a police cadet training facility. The building was vacant for a while, then owned by an eccentric man named “Sunny”. The building is also the center of a few urban legends, including one that said either Janet Jackson or Jennifer Lopez stayed in the building while in Detroit and another that says that there once was a jacuzzi in the building. The building was sold in 2017 and it is currently under renovation to turn the building into offices and a living space. 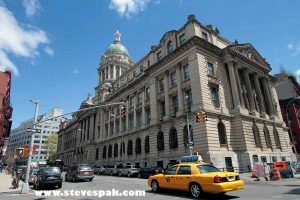 The Old Police Headquarters in New York is one of the most grandiose police buildings that has been preserved. Designed by Hoppin and Koen, the building was built in 1909 in the Little Italy area of the city. A restaurant across the street from the building was a popular place for officers to eat during the 1920s, and one rumor says that there was a secret tunnel connecting the two buildings so that officers could enjoy an illegal drink during Prohibition. The NYPD moved buildings in 1973, leaving the palace-like building empty until it was bought by a developer in 1983. The developer turned the building into upscale apartments and a few office spaces while preserving the historic façade. Philadelphia boasts one of the oldest police forces in the United States of America and is housed in a very distinctive building. The Roundhouse, so called because of its unique circular shape, has been the homes of the Philadelphia police department since 1963. It was designed by Geddes, Brecher, Qualls & Cunningham and its Expressionist design was intended to be welcoming and inviting. 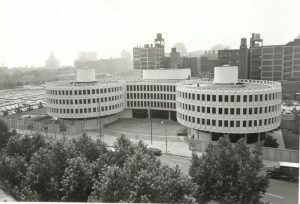 According to Ashley Hahn of PlanPhilly website, “It was only the second building in the United States using the Schokbeton method to post-tension the concrete, so it’s also known for its pioneering engineering.” However, not every Philadelphian loves the building, and some compare the shape of the building to handcuffs. In 2017, Philadelphia Police decided to move into another iconic building in Philadelphia, the former Philadelphia Inquirer Building. Beshouri, Paul. “At 113 Years Old, Grand River Station Soon Becoming Lofts.” Curbed Detroit. 8 February 2013. https://detroit.curbed.com/2013/2/8/10275386/ongoing-renovations-for-last.